Parents are the first teachers of your young child with ADHD. You will incidentally teach your child the developmental skills associated with daily living activities. As with other children they will achieve developmental milestones normally but they will possibly be distracted, not finish tasks and be eager to move onto the next thing that has gained their attention. As the child with ADHD may always be on the go, get them to help you set the table and then follow through with the function of sitting at the table and eating the snack or meal. This will help your child to build up a tolerance for sitting, understand that there are requirements to eat at the table and not to wander around while eating. This will require close supervision to begin with to ensure the process is seen through to the end. Young children are keen to move onto the next activity and let’s face it, going to the toilet and cleaning up afterwards is not a high priority for them. Spend the time in these early years and your child will be ready and independent for pre-school and school. Use this as an opportunity to develop language along with independence. 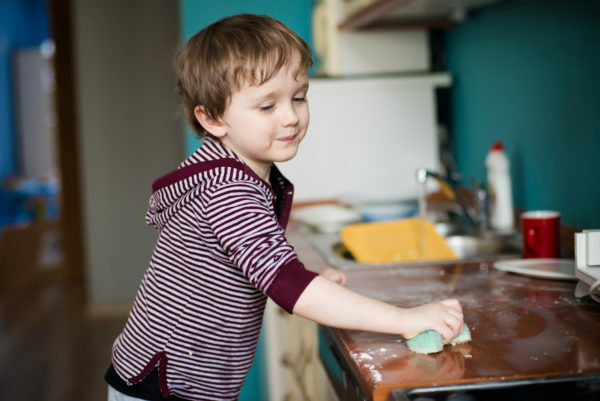 Concepts such as left and right, over and under, first and next, into and through, along with labelling of items can all be part of developing this essential personal skill. Teach your child as early as possible to take responsibility for their personal hygiene. Things such as cleaning teeth, washing face and hands, taking a bath or shower, brushing and combing hair. Again these are all distractible moments for the child with ADHD who is impulsive and on the go. There is great potential for these tasks to not be done or only partially completed. Social interactions for your child with ADHD can be an area of major challenge. Due to their hyperactivity (restlessness and fidgeting), difficulty with concentration (forgetting instructions), impulsivity (losing control of emotions easily and talking over the top of others), these all add a further layer of challenge in the development of this personal skill area. To support your child’s development put boundaries in place for communication, affirm the positive behaviour interactions, use visuals to help with memory and develop play skills to support attention and interactions. For your child with ADHD the development of personal skills will be ongoing. As they grow and have exposure to more children and structures in their environments they will need support to understand why these things are necessary and how they can learn to manage themselves. If your child has a further learning disability such as Autism Spectrum Disorder(ASD) then further supports in the development of personal skills will need to be put in place to manage this area of development.